Good morning, friends! It’s one of those mornings. The kind of morning when I drop my husband off at work, grab some coffee on my way home and then sit down and browse the internet a bit, looking desperately for something to write about. This morning I happened upon a memory on my Facebook from my first blog. The post was called “Cats are Like That” and it was about cats and my love for them and my experience with cats. So today I decided to tell you about cats, because mine have been especially special this week. You would think I’d know better than to leave my rings around. Really, I should know better. Calamity likes to grab them and play with them in the corner and I’ve always caught her before she could do something with them, but this time I was not mindful enough. I took off my birthstone ring Monday night after we’d gone to bed thinking I’d put it back on before the cats came in in the morning. I did not. I forgot I’d taken it off until I was driving back from dropping Logan off at work. So I go in and I sit down and start fiddling with something and then remember again that I need to grab that ring. When I entered the bedroom, however, the ring was not on the night stand. It wasn’t on the floor, either. It wasn’t anywhere to be found. I looked all over the bedroom, under every piece of furniture I could find, even in the basement, in case the cats had batted it under the door and it had fallen down the stairs. No trace of the ring was to be seen. This is most upsetting, naturally, so I got in the shower to calm down a little and got out to look again. Still nothing. I have no idea where the cats have hidden it, but I am fairly certain of one thing: they didn’t eat it. I am fair certain of this because I’ve been very carefully monitoring their poop for the past three days. Yup, as gross as that is, I’ve been stalking the litter boxes to make sure that A, they are indeed pooping, and B, the ring doesn’t magically appear in said poop. It has yet to do so, so I’m pretty sure it’s probably not in there. If it were and wasn’t coming out we’d be having lots of other problems. So that’s been my week. I’ve been watching my kittens with a sharp eye to make sure they don’t start puking blood because they’re blocked up by my ring. They haven’t. 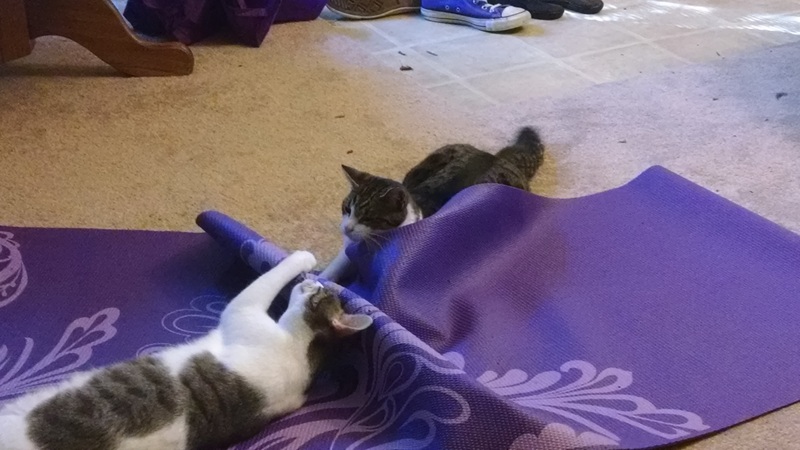 They’ve been eating normally and pooping regularly and playing like crazy, because that’s how cats do. Calamity is currently sleeping in a pile of shoes because she got tired while chasing something, I’m sure, and decided to take a nap where she was. Pearl is probably in the office sleeping in her chair. The time is coming for my cats to go back to the vet for more shots. They will not be pleased when this time comes. Luckily for them, they have to wait until we get a second carrier because they out grew the one my sister got us for Christmas last year. One will fit, but definitely not both. So we have to decide if we’re getting a big carrier so they can ride in it together, or another small carrier so they can each have their own. Once that has been taken care of, it’s off to the vets for their annual shots and a check for ear mites, because they’ve been scratching at their ears a lot lately and I’d like to get that checked out. If it were just the shots I’d be more willing to procrastinate. They don’t go outside, so I’m not super worried about that. But the ear mites are no fun for them and I’d like to deal with that sooner rather than later. I’d really like to just call and see if I can just pick up some ear mite stuff without bringing them in, but then again, I don’t want to call and need to bring them in if I don’t have a way to transport them. As much trouble as my cats are, I can’t imagine living here without them. We did that for a year and a half and it was awful. Though, I will say the ability to leave a beverage unattended on the end table was kind of nice. Seriously, though, I missed them a lot when we went on vacation and I’m very glad to have them in our lives. Cats are special, but that’s what makes them so very entertaining. And when they do decide to be sweet and snuggle with you for a little while, it’s all worth it. Even the poop checks.